For those unfortunately not familiar with Fifth Angel, the band was formed in Seattle, WA by high school friends in 1983. Like another of their hometown’s Metal bands, Sanctuary, they were heavily influenced by Queensrÿche who had become popular across the world. 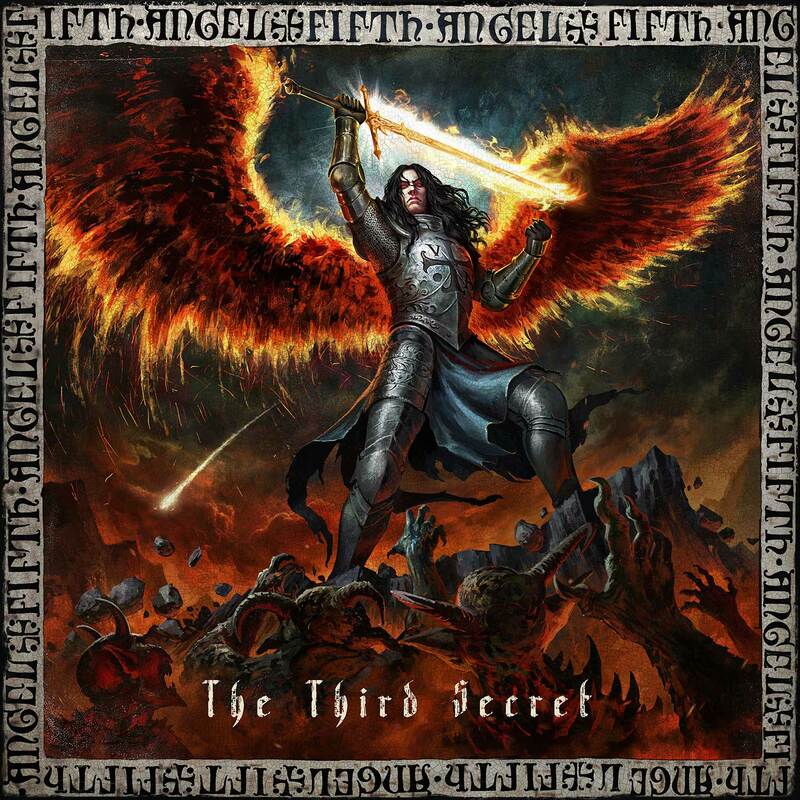 Fifth Angel’s eponymous debut was released in 1986 and was the first record produced by Terry Date (Pantera, Soundgarden). “Midnight Love” from their second album, Time Will Tell, was the theme for Howard Stern’s radio show for over four years. It isn’t like the band was some flash in the pan as pessimists may insist when glancing over the band’s discography. The three years between forming and getting signed were undoubtedly arduous as the band had to work overtime to claw their way to that record deal. Grunge hit the band hard as was the case with many other killer bands. After reuniting to headline the “Keep it True Fest” in Germany for the second time just last year, Kendall Bechtel, now on guitars and vocals, let Nuclear Blast hear some demos. Based on the demos, the band was signed and The Third Secret is their resulting new album. Fifth Angel are now a fully-realized, revamped version of the band, and like Venom Inc., are firing on all cylinders in go-mode. This album has seriously been on my playlist for a while now. At first, it was clear that it was truly Fifth Angel. What became apparent, though, as the record played through was that it has a solid, aggressive side married to epic traditional Metal. It is infectious like all truly well-written albums are. Upon starting the album up now after well over a dozen sessions of listening to it in full it is clear that in addition to how catchy it is, it is seriously heavy. It’s true that adjective became over-used before most reading this were born, but there is simply no better word in my mind. The guitar sound is so vividly alive, radiating in sparkling distorted splendor, though viciously violent as well, a monster plated with Metal. The guitar sound is completely articulate, and the riffs are there. There…in that corner where we fit everything that is impressive. It’s simply there. The first track, “Stars Are Falling,” has emphatically more than enough firepower to start the album. It gives a full view of the present version of Fifth Angel, a sound which most will appreciate. When the vocals come in, the idea resounds throughout my mind each time how Bechtell’s voice sounds momentarily similar to Dio at times before his own color of tone washes it away. This is also present in the second track, We Will Rise” as well but the occurrence is for two or three words and this time, he soars higher to wrestle out of it. By the time track three, “Queen of Thieves,” hits, one is fully vested in the experience, now undoubtedly having raised the volume several times. This album becomes more and more absorbing as it plays through fully. “Can You Hear Me” is the fifth track is the catalyst of a personal recompense for the Metal ballad. This is not “Wanted Dead or Alive,” though the band were successful by industry people’s opinions and journalists as well. This is like an old school Scorpions song or Dio, even contemporaries’ Crimson Glory have strong ballads while keeping true to Metal. The title track has a solid medium groove with a huge bass line, first naked and then joined with monster Thrash-styled double picking from the guitars over the top through the pre-chorus where the singer’s chops start to be tested. Like classic Dio or Warell Dane, he burns any doubts in the flash fire of his signature tone, totally owning the song. When he screams, “The world will burn,” chills encompass your arms while realizing that no matter if this record is a “hit” like Firepower by Judas Priest, released just months ago or an album that, though personally loved and abundantly professed to all such as Unholy Terror by W.A.S.P., released 17 years ago, somehow missed the mark when aiming for commercial success. This is a singularly focused moment for Fifth Angel, for by my measure, The Third Secret has all the traits of a classic Metal moment, suitable for all kinds of times including: playing it for all of your friends when you were skipping school as a kid and sharing a cigarette between four people, or a kid in thought and spirit, though partially veiled, commuting to and from work to spend the day with people one would never speak to in real life having to rely upon the imagination and carefully hidden ear buds playing The Third Secret. Despite the thinly opaque bond formed with the two versions of yourself represented, both, no matter what, with always love Metal. This is that kind of album, one that serves as the soundtrack to your escape from the real world, hanging out with your best friend, or throwing down with your sparring partner. When taking a look at the musicality of the album there are two points to consider: how is the sound of the band’s present compared to their previous albums, and what makes up the instrumental background of the album. When listening to Time Will Tell (sadly, I don’t have the self-titled album), it becomes clear after a few tracks that the glimpse into the band’s past will truly be compelling. There are cases of filler on the album, unfortunately, but it is definitely competitive when held up against contemporaries of that scene. With a tasteful approach often similar to Neil Schon, using the leads to perform in a way such as to tie the song together via melodiously delivered parts, the guitars work on so many different levels including rhythmically, melodically, and harmoniously. Individually, though Bechtel performs two roles now: guitarist and singer. There are plenty of good bands that have a good guitarist and a good singer, but it is rare to see a band with a good guitarist who is a good singer in the local scenes I’ve been around. Bechtel, however, is an exceptional artist because he is a frighteningly-skilled alchemist, an exceptional guitarist with riffs for days who also happens to be able to sing in that area of vocal talent where the singer’s pipes clearly support and aid in the delivery of their chosen color per se. Speaking from the perspectives of both a Metal fan in and of itself and as a bassist/guitarist, I appreciate the total sum of their discography; however, this record really puts things up front in the mix giving it a defined, hard-hitting, unique sound. That sound is all the more defined as the bass drum is jamming through the whole album adding extra jabs here and there including spots to fill out the mix. Having a rhythm section such as this with John Macko on bass and drummer, Ken Mary, forms the foundation for a more modern sound and broader appeal. Like many great Metal bands, Fifth Angel use in-your-face bass to lock in with the drums while also reinforcing the riff. After all, the definition of a riff has often been stated as being a phrase repeatedly played by the guitar and bass together. This is Metal from the old school where studio time was unbelievably expensive and often had to be paid back by the band if the project bombed. Because of this, musicians were as prepared as possible before entering the studio. Being that studio time was the avenue through which this band wanted to make their presence known, there was, therefore, more emphasis upon being drilled in preparation. A result of that is the clear way in which the older guys play circles around younger folks and have mysterious guitar tone secrets which are sought after by many YouTube hosts and guitar players. At this very moment is the ideal time for the band to make a return. The climate is just there with the other releases this year from classic or traditional Heavy Metal. It is beyond any foresight that there is genuinely such a collection of classic bands releasing albums this year. Including this band and the aforementioned Judas Priest, the addition of Lizzy Borden forms a triumvirate of true Heavy Metal heroes releasing new albums this year. This album has such a full, well-rounded and hard-hitting feel, that it wouldn’t be surprising to hear of bands’ wanting to try and copy it. I’m not in any way encouraging such actions, but I’ve seen bands ask to have their album sound “like Lamb of God” or “more brutal than Pantera”. Simply put, for this style, the album is a clear-cut representation of the ideal sound. What continues through repeated listens as the melody gradually enters into one’s soul, is respect for the magic used in the creation of this album.